The image to the right shows shows the IMACS™ properly installed between the barrel and flash-hider. 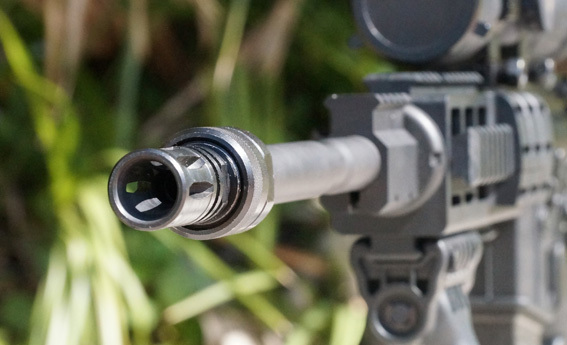 The adapters ( below ) field install to either the IMACS™ or to the Blast-Mate™ Percussion Shroud without any tools or the removal of the Flash Hider. The IMACS™ (which is purchased separately) provides the dynamic platform for these (and many other) products to work. No tools are required allowing for quick field installation as desired. These devices are "Made in the USA" from industrial grade steel. They are not cheap thin versions to save money. 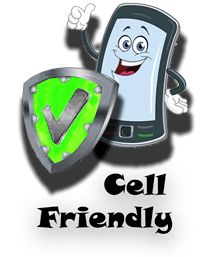 These are heavy duty products that can take what you throw at them. 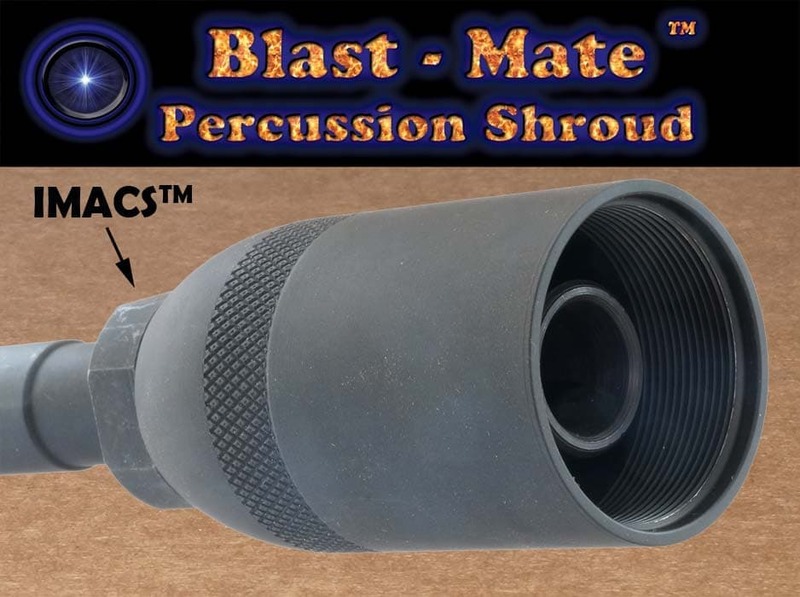 Image shows the Blast-Mate™ Purcussion Shroud installed over the existing A2 Flash Hider. No tools are required to add this device whenever desired in the field, on the range, wherever! This device has an internal 1-9/16 thread allowing for other products to be field installed. CARE - Oil as you do your barrel. WD-40 works great as do all gun oils. MagPhosphate crystals store the oils and provides a long lasting barrier against rust. Here's a fun item. Imagine shooting a golf ball over 300 yds. This add-on device makes the range a whole lot more fun. 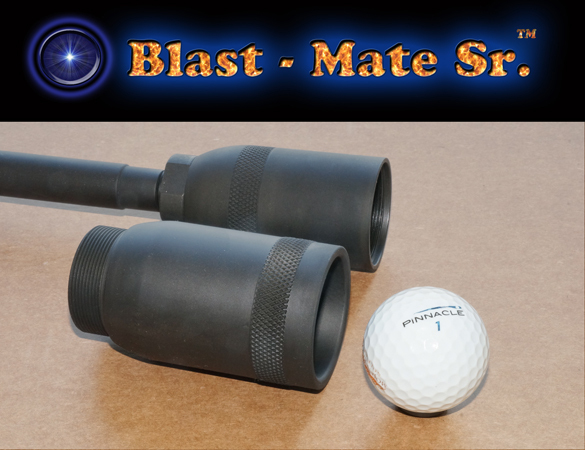 Challenge yourself and friends to nail targets over 100 yds away. Used Golf Balls are easily obtained from places like WalMart, golf courses, etc. USE BLANKS ONLY (Yeah - we had to say this) We're not responsible for any injuries that may occur for failing to use this device as intended. 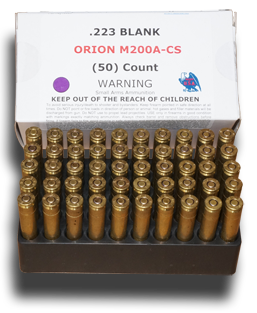 We sell Blank .223 50rnd boxes below (no excuse right?) and so do many gun shows, so be safe! Boxes are shipped ORM-D FedEx separate from any adapter order. (50) rounds of .223 Blanks, tray sorted and clear tab tamper-proof sealed. CAUTION - blanks are dangerous. They can produce serious harm and death if fired at a living creature. It is not necessary to use a Blank adapter with an IMACS Golf Ball Launcher. Manually cycle each round. 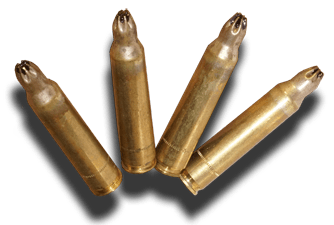 CARE - Blanks are notoriously dirty rounds. Clean your weapon accordingly.